What's this miniboro all about then? SW: It's a retrospective look at the 'best bits' from the first 100 issues of FMTTM. 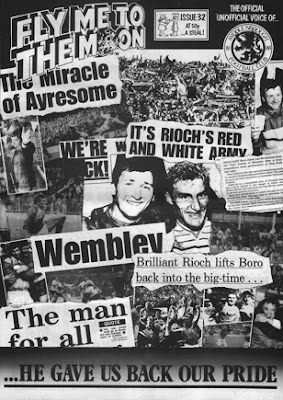 The site hopes to trace Boro's recent history through the dog-eared pages of its long standing fanzine. For some it will be a history lesson, for others a trip down memory lane but either way I hope it will be an interesting and entertaining read. How many copies of FMTTM were you knocking out in its heyday? SW: Before I answer that one it's probably worth explaining that I am not affiliated to FMTTM myself, I provided the occasional cartoon and article between 1990-93 but apart from that I'm just a fan that has decided to put an archive together. But to answer your question, unlike most other fanzines, FMTTM has always prided itself on producing an issue for every single home game; having a circulation of over 2000 in its heyday. SW: It still appears every home game; the last issue being #488, although the circulation is now just under the 1000 mark. So have you made enough money to buy the bit of Holgate End fence that Bernie Slaven used to jump on then, or are the profits ploughed back into the publication? SW: I make no money from FMTTM, miniboro.com is a purely independent venture. 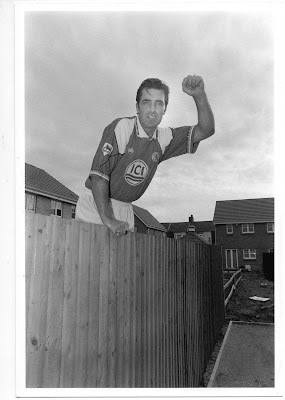 Funny you should mention the Holgate though, as I do own some of the spikes that used to adorn that fence, a very proud Ayresome Park possession. RN: I bought the first house at Ayresome Park and invited Bernie Slaven around to jump on my garden fence. Bernie Slaven now officially takes over as EFW's all-time hero. He usurps Gary Bannister who signed our actual banister in the hallway of EFW Towers about 15 years ago. Fact. Why has it taken so long to archive all this gold? A laborious task presumably? SW: I'd toyed with the idea for about 7 years but it just felt like the time was right. There had been so much apathy under Southgate and Strachan that people were harking back to days gone by, as tends to happen in times of adversity. So I wanted to give an authentic view of those times and see how much of it had been watered down, forgotten about or rose-tinted over the years. Did you have the complete collection stashed away in the loft? SW: That description is pretty accurate. The first 100 issues had been sat on top of my wardrobe for about 20 years (in official Boro binders - for shame). Then one day I decided to have a bit of a thumb through them and before I knew it I had lost about 4 or 5 hours. It was incredibly absorbing; the thing that struck me most was not just the quality of the writing but also the parallels that could be drawn from then and now. There were also some genuinely important issues and historical events, racism, Hillsborough, ID Cards, all-seater stadiums etc, a really important time not only for the Boro but football in general. FMTTM are invited to press conferences at the invitation of the club, is it easy to remain independent given that fact? RN: Yes. I started going because I wanted to give fans the whole story from press conferences - the questions as well as the answers and the answers in full not edited. But I don't think that compromises anything. In fact I've found the football club only too willing to work on fan projects recently. John from twel12th man and myself helped work on the questions mailed to fans to vote on pre-match music Pigbag or Power Game or something else. Also of note the fans were asked if they wanted post match music and the majority said yes. Interestingly enough. SW: In terms of miniboro.com I hope to remain as objective as possible, especially as part of the player interviews I have been conducting. Hopefully this objectivity will mean I can get away with a few questions that might not be asked in your standard press conference. So have you had any run-ins with the club down the years? Have any contributors to FMTTM gone onto bigger things? SW: Quite a few have gone on to be journalists, most recently Andrew Glover who now works at the Sunday Sun. Bob Fischer who is responsible for FMTTM covers and the celebrated Donkey Watch, has a radio programme on BBC Tees and has also written a book entitled Wiffle Lever To Full. Another author is Daniel Gray who has 3 books to his name; the most recent (from last year) was Stramash - Tackling Scotlands Towns and Teams (it's also worth pointing out that Dan's first published writing was with FMTTM). Finally there is Paul Thompson who went on to become photographer at the National Media Museum at Bradford. I should also mention both Harry Pearson, who was already a well-established writer and Anthony Vickers who continues to work for the Evening Gazette. I support Brighton, we're just about to move into a shiny new stadium and fans are queuing around the block for season tickets. In your experience, how long before this novelty wears off, the crowds disappear and the place seems a little soulless? SW: I think it really boils down to the capacity of the stadium. I notice you had an average attendance of 7351 last season, whilst The Amex will hold 22,374 (with an option to expand to 30,000). So in order to fill your ground you will have to more than treble your attendances, which seems like a tall order in terms of sustainability. For our own experiences we went from a capacity of 26k at Ayresome Park (average 17-20k) to 30k at the Riverside (sold out most games) which was probably about right for the time. Our biggest mistake was filling in the corners to take the capacity up to 35k, we've always had roughly 15k diehards and roughly 20-25k when the times were good but we've never realistically been a 30-35k club. The huge sell outs we had under Robson were the exception rather than the rule, it's a tricky one though because to progress you must take a gamble and if we'd only built a 20k stadium Gibson would have been accused of being unambitious or over cautious etc. To give you an idea of how things can go when the novelty wears off and the football turns sour, since coming back to the Championship our crowds have fallen as low as 10-12k (which was a genuine shock some of our younger fans who had only ever known Premiership football). However, the improvement under Mowbray saw us end up with 20k for our last home game of the season, it's a step back in the right direction but still 15k short of capacity, so i would say enjoy the good times while they last because you never know when the bubble is going to burst. Do they still play music following a goal at the Riverside? That can't be good for your health. SW: The PA system at the Riverside is a very contentious issue for Boro fans. During Mogga's prime in the 80's and for as long as most Boro fans can remember, we always ran out to the Power Game. The move to the Riverside stopped all that and instead we were lumbered with Pig Bag, which also became the music used when we scored, although this has evolved into The Fratelli's Chelsea Dagger these days. A lot of fans level criticism at the PA announcer Mark Page, I've asked if he would be interested in putting his side across via a Q&A with miniboro but unfortunately he has declined. The thing is, it has become a standard joke among away fans to chant this inane tune at us whenever we are losing. But it goes deeper than that, the happy clappy conformity of it all still sets my teeth on edge. At its height we even had corporate sponsored foam hands for people to wave, clap and point with like so many trained seals, which lent the wretched stench of ITVs Gladiators to proceedings. We might as well have gone the whole hog and had John Anderson referee our matches. "Middlesbrough you will go on my first whistle" with John Fashanu announcing the teams, "Andy Halliday. you will be chased down the wing by Saracen! - Awooooga!!! Despite being Boro's most successful manager, the fans didn't really take to Steve Mclaren did they? SW: In all honesty I loved it when he became England manager, so many people had said the same thing to me over the years "but he's your most successful manager, why don't you like him etc etc." so when the announcement from the FA was made, I went to each and every one of those people and said "Now you'll see..."
I can't fault his achievements, but let's not forgot the European adventure which led us to Eindhoven was during the same season a fan was so incensed by the standard of football on show, he ran from the crowd to hurl his season ticket at the dugout in disgust. On closer inspection, winning those unbelievable quarter and semi-final UEFA matches required McClaren to completely tear up his own game plan and agenda, throwing 4 up front and hoping for the best. Perhaps if he'd done that a little more often the fans might have warmed to him. But at the end of the day he wasn't paid to be liked he was paid to get results and maybe win a trophy or two and ultimately that's what he did. On the other hand, just watch that clip of him doing his FC Twente Dutch accent and I think it tells you all you need to know about him as a social being. RN: I went to every European game home and away in fact went to every Steve McClaren game home and away and had some of the best times of my life. I could not believe the attitude of Boro fans at the time. It was the greatest success I had ever known as a fan, I saw some phenomenal games home and away and I was watching a really clever master tactician at work. The fact the fans didn't take to McClaren was a massive frustration. The fan that threw his season ticket at McClaren was pardoned by the Chairman. A couple of weeks later he was in Romania watching us take on Steaua Bucharest - shaking his head at what he had done. And are you happy now with Tony Mowbray? "Mowbray is a confident, principled man with a commitment to improving performances and footballers as well as results". SW: Boro's previous training ground was terrible (we have a brand new state of the art one now). But back then, every morning the players would have to go around the grass and kick dog turds off the pitch before they could start training. Having arrived from the dizzying heights of Juventus, Ravanelli could not believe this was standard practice and refused to train with the rest of the team in protest. SW: H'mmmm that's a tough question, but I reckon they will both go down next season; it's too close to call. Do Boro still have any hooligans up at the Riverside? Ayresome Park was one of the most intimidating grounds I've ever been to. SW: I think every ground still has its share, it depends if you are actively seeking that type of element I suppose. However, the atmosphere at Ayresome did always seem to have a bit more of an edge to it than the Riverside in my opinion. Maybe that's the cost of moving to one of the first 'identi-kit' stadiums? But it takes a while for areas of a ground to establish themselves properly, I think the mistake that was made with the Riverside was that they thought everyone who used to stand on the Holgate would now just sit in the New Holgate etc but it doesn't work like that and I think the atmosphere has suffered as a result of the move. That said it was a necessity at the time and there have been some exceptional atmospheres over the years, just not at a consistent level I would say. What's the atmosphere like at home games now? SW: There has been a real shift since Mowbray took over and I think it can only improve. As mentioned earlier the atmosphere at the Riverside hasn't always been the best, for a variety of reasons but there are two groups of supporters taking an active role in trying to change that. They are Red Faction and Twe12th Man, incidentally both will be participating in a half time penalty shoot-out during the Sir Bobby Robson Fund charity game at the Riverside on May 20th. Each have their own views and principles but both are committed to improving the match day atmosphere, for example Twe12thMan recently negotiated with the club to move a number of fans to a specific section of the North Stand to help improve the atmosphere in a more central position (Block 23). The signs this season have been very encouraging and I think the general feeling is that the fans are reconnecting with the club under Mowbray, he really is "one of our own" and the fans obviously respond to that kind of thing. SW: Away days have been a revelation, I went to the Hull match towards the end of last season and it was fantastic, a great day out. What surprised me most was that when we went a goal down, the thought of getting beat didn't even cross my mind. Suffice to say I haven't felt like that for a very long time. I don't want to tempt fate but going to a Boro game (home or away) is beginning to feel like an event again, whereas for the last 4 years it has felt like a sentence. The manager and players must take a lot of credit for how they've turned things around but for a while our away support was the only positive left to hang on to, especially when the home attendances started to tumble. You've had a few European ventures with Boro, what was the best trip, fans wise, on the road to the Europa League final in Eindhoven? SW: Regrettably I didn't get to any of the away games during our Euro run. Hindsight is a wonderful thing and a key theme for miniboro.com but looking back, I should have moved heaven and earth to be at those games and to be fair thousands of Boro fans did just that. I will always be jealous of the experiences they had but also grateful for the loyalty, commitment and passion they showed throughout Europe, I think they gained more than a little respect from some of Europe's bigger hitters during that time. RN: That was an amazing season in Europe - it took us two flights and a nighttime rail journey through northern Greece to reach our first opponents Skoda Xanti. Less than 100 of us made it but it was the start of an amazing adventure. And finally for Steve, you're new to Twitter, can you sum up what it's like to support the Boro in under 140 characters? SW: It's like eating a Kinder egg, tempting to start with, relatively dull once you get in to it but every so often you get a fabulous surprise. Do yourselves a favour and point your mouse towards the new miniboro website. Fly Me To The Moon is another Boro website with a vibrant fan forum. The joyous thing is that it's totally genuine, and not photoshopped. Both the photo and Bernie Slaven are utterly fantastic.